Many functions of amino acids, including protein synthesis, require that they be in the l-form. 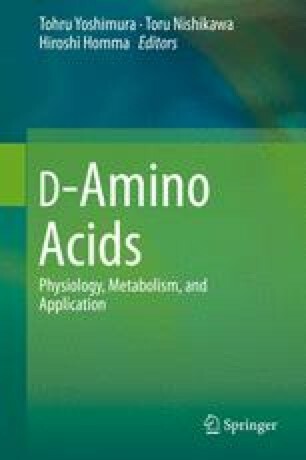 As a result, in most biological systems, the levels of free d-amino acids (DAAs) are enzymatically suppressed. However, the site-specific synthesis, accumulation, and release of DAAs do occur. In fact, the accumulation of DAAs in the nervous, exocrine, and endocrine systems suggests that they perform specific functions. The focus here is on the well-studied DAA, d-aspartate; we review the advancements in the analytical approaches used for its detection and characterization and discuss the role it plays in the structural and functional organization of numerous biological systems of nonmammalian animals. The view that d-Asp has specific functions is supported by a large body of experimental data showing its endogenous synthesis, accumulation, release, stimulation of follower cells, uptake, and enzymatic catabolism. A variety of biological models, each having distinct anatomies, morphologies, biochemistries, and behaviors, have been used to investigate the fundamental mechanisms of d-Asp involvement in the normal and pathological functioning of cells and organisms. Many physiological and behavioral effects induced by d-Asp have been documented, demonstrating it has neurotransmitter, hormonal, and neuromodulator roles. Similar to many classical neurotransmitters, d-Asp has physiological roles that are conserved throughout the evolutionary tree, with nearly all studied animals shown to possess and use d-Asp. This work was supported by the National Science Foundation (NSF), Division of Chemistry, under grant CHE-11-11705 (with co-funding from the Division of Biological Infrastructure), by Award No. RO1 NS031609 from the National Institute of Neurological Disorders and Stroke (NINDS) and Award Number P30 DA018310 from the National Institute on Drug Abuse (NIDA). The content is solely the responsibility of the authors and does not necessarily represent the official views of the NSF, NINDS, NIDA, or the National Institutes of Health.